According to…well, i read it somewhere, there’s about 1.5M mini split systems (or ductless) being installed every year. Add this to the millions and millions (some say north of 8 million in the US) already installed and this flexible cooling technology is really becoming prevalent. Mini split, multi split or other split systems offer some great benefits They are flexible cooling – or heating or both – solutions in that you can install them in specific areas of the house without having to add ducting and large air movement systems. They operate in a very similar fashion to other condensing and evaporating systems, like a standard ducted HVAC system or even a window unit. However, unlike these other systems they can be an absolute bear to maintain and therefore sometimes go neglected. this neglect ends up costing home owners and business owners int he wallet and in the nose. In the wallet because these systems will get less and less efficiency if not cleaned properly and in the nose, because they will start to stink! The major reason these are tough to maintain is that the evaporator is installed on a wall, generally in a high visibility area. Accessing it can be challenging and then using the right kind of tools can cause damage to the surroundings areas. Well, we thought long and hard about this. How do we help the contractor access millions of units that need maintenance like any other HVAC system. And that’s where our Ductless/Mini Split Maintenance Kit came from. This kit contains two specific cleaning agents. 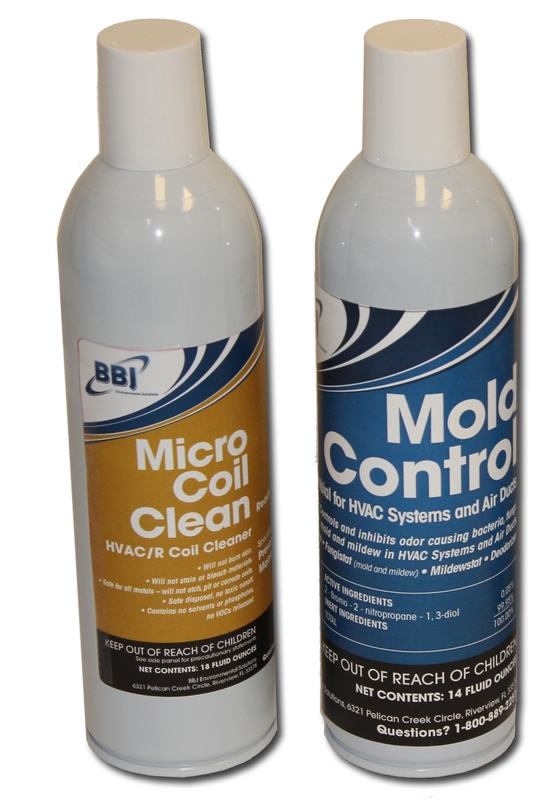 The first is Micro Coil Clean, a biodegradable, non caustic coil cleaning agent in an aerosol. Easy to apply and does a great job cleaning coils. The second is Mold Control for HVAC Systems and Air Ducts. This is an EPA registered mold and mildew inhibitor that is registered for use in HVAC systems. It’s the only one of it’s kind that we know of that is labeled for use while areas are inhabited. not only does it manage mold and mildew growth it also keeps odors at bay. No more dirty sock syndrome. When used as directed this solution will keep systems humming and smelling great. Questions? just ask away in the comments. How can I purchase the two products advertised on this page to control bad odors in mini-split? If you are an HVAC contractor, your local supply house can get you BBJ products. 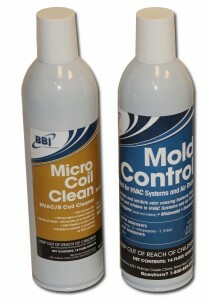 alternately BBJ products can also be purchased from IAQsupplyhouse.com.